Hello. I'm Joe Ritsma, of Mathnasium of Waterloo, your neighbourhood math-only learning centre. We help kids in grades 2-12 understand math by teaching the way that makes sense to them. We are open! Come see for yourselves! OUR centre is YOUR centre and we together are going indulge in exciting explorations within the world of mathematics. Very pleased! My daughter finds it very helpful. I like how u encouraging them do more by giving something to empresses their feeling.evertime they talk about getting something to discussion. Flexible hours and suits an active student schedule. All tutors are friendly, knowlegable, and apprachable. My son developed a confidence in math. Excellent! Highly recommend, Joe and his team were awesome. We saw significantly higher marks and our son actually enjoyed going! We’ll be back later this year! It’s the best tutoring in KW. I have tried many and this is perfect for all grade and they really teach a lot. My child in grade 10 improves a lot in her grade. Thanks to all instructors you guys are amazing. Excellent approach to learning and we love the teachers. My son finally got an A on a math test. My daughter has been going to Mathnasium Waterloo since October 2018. She has been working on a lot of topics that she had been struggling with since kindergarten. She is starting to make the connections and is improving at school. The additional support from Mathnasium has been instrumental in boosting her confidence with math. Fantastic staff. Very helpfull with my children's math. Highly recommended. My son and daughter both attend Mathnasium and have both expressed how helpful it has been. They have started the new semester with more confidence in their abilities and a good understanding of the areas they are working on. I personally have found Joe to be very accommodating and helpful. Over all it has been a very good experience. My son does not freak out when he sees math. He loves the easy approach to tackle math problems. He also loves the positive reinforcement he gets from the tutors. Thank you Mathnasium! My daughter’s confidence at math and school in general has increased because of Mathnasium! In the short time we have been enrolled in mathnasium, our sons confidence has increased in math. We love the flexibility, as it works around our his busy schedule. Joe at Mathnasium Waterloo is great! Really knows his stuff and goes the extra mile to help the student with whatever their needs are. I would definitely recommend Mathnasium to any student who is struggling even slightly with Math. The sooner you get on top of the math problems the easier it is to excel. My children enjoy going to Mathnasium and never seem to try and avoid it even after a long day at school. I believe the atmosphere and that they see improvement in class helps. Good system for learning with motivation. Freindly staff and good learning atmosphere. I like my son can bring questions and concepts to Mathnasium and they will help him understand and give tips ans tricks to concepts that he is not shown is school. Joe has been excellent, my son really likes going to Mathnasium and although early we’re starting to see his confidence with math grow and some better marks already which we’re very happy about! Joe was a great help to our daughter and was instrumental in helping her get through grade 11 math. My son usually hates doing any kind of math work at home but when we enrolled him in Mathnasium, he loved going there and doing math everyday. It was a huge milestone for us. We never expected such a change to happen in a short time. Joe is wonderful with kids. Keep up the great work. Mr. Ritsma is awesome. The learning environment is fun yet calming. My son likes it and feels more positive about math these days. Joe !! Excellent teacher. My children felt comfortable and homely when they were in mathnasium!!! So far the experience has been good. Lots of math support and instructional time. My daughter loves Mathnasium. She’s so eagered to learn and became very confident in her math skills. Thanks Joe! This was a great experience for my son. He did fine in math at school but not as well as he is capable of. He needed to build his confidence in his skills and also to learn to focus and read the questions properly to know what they were actually asking. The staff and the atmosphere made him feel comfortable to ask questions and not feel pressure. He was quite proud to show me what he had been working on when I came to pick him up. I think his time at mathnasium has definitely helped with confidence, we'll have to wait til school is back in to see how he transfers what he has learned. The only reason I don't rate mathnasium a 10 is because of the hours. Fridays and Saturdays are probably the best days for me to bring him because we aren't loaded down with other obligations but unfortunately they aren't open. We have had a wonderful experience at mathnasium . Our daughters confidence improved greatly, as did her attitude toward math. Her grades even improved the first month! I am really impressed with the rapport that Joe, the owner, has with each kid. Once I get my son there, I never hear any complaints which is saying a lot. He is finally starting to work independently but I can see the staff are good about knowing to check in with him. I already have referred a friend for the fall! 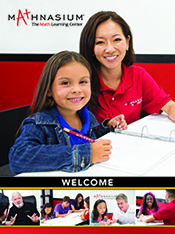 We like Waterloo mathnasium because the tutors are knowledgeable and patient. Try try different ways to explain until we understand. We feel at ease going and they make maths fun and easier.